Leak reveals massive trove of private communications. The Australian Signals Directorate is able to tap into the details of hundreds of billions of private communications records, thanks to a custom Google-like search engine built by the National Security Agency (NSA), new leaked documents reveal. The documents - dated from 2007 and 2010 - are attributed to whistleblower Edward Snowden and were obtained by The Intercept. 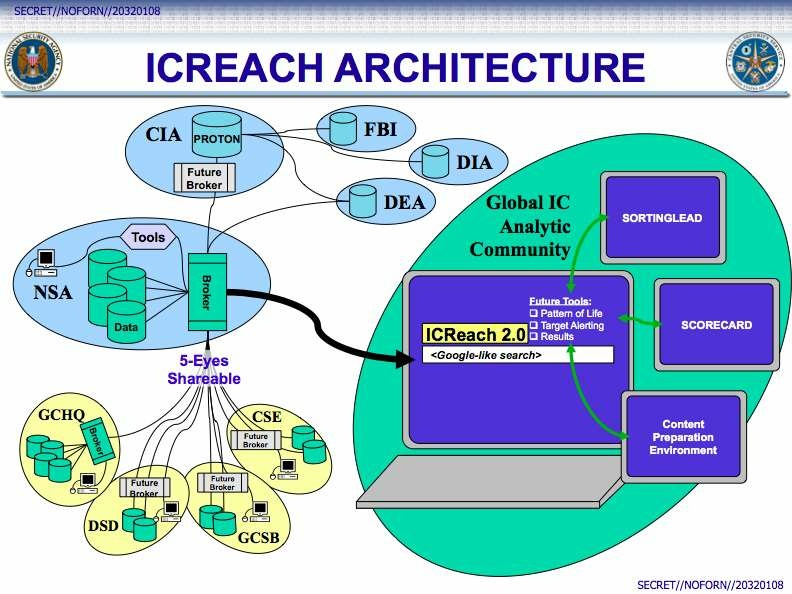 The documents describe the ICREACH search engine, which is available to over 1000 analysts at 23 US government agencies and shared with Five Eyes partners, including Australia. ICREACH contains over 850 billion records of metadata on phone calls, mobile phone locations, emails and internet chat logs, albeit not the content within. The number of records grows by one to two billion a day, the documents show. The search engine covers the landline phone network, INMARSAT satellite communications, cellular mobile networks and - using the NSA's digital network intelligence (DNI) data gathering - users' email addresses, chat handles and the protocols used for these communications. Information in ICREACH is kept for up five years, with the US Federal Bureau of Investigation, Drugs Enforcement Agency and the Defence Intelligence Agency being the most active partners in the program. Australia's Signals Directorate, the New Zealand Government Communications Security Bureau, the UK Government Communications Headquarters and Canada's Communications Security Establishment appear to have or have had access to ICREACH. The documents also suggest these intelligence agencies share their metadata collections with US counterparts. The Australian government is presently pushing for expanded metadata collection and data retention requirements for telcos and ISPs. It has not informed Australian citizens how much of the information will be shared with overseas spy agencies under the Five-Eyes agreement. The system appears to continue to be active, with several ICREACH and the older PROTON metadata program positions advertised in the United States and Europe by their respective intelligence services.